As a training tool – running a PTP test/assessment is invaluable! 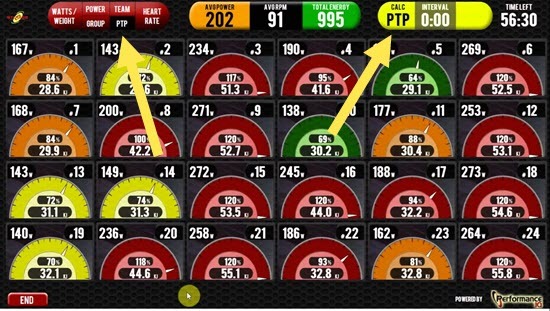 When, or how often, should we be using using the PTP (Personal Threshold Power) mode screen? What exactly should we have our riders doing, during the PTP (Calc) test/assessment? First, for those currently not using a Display System in your studio, let me explain what we're talking about. NOTE: I'll focus on Performance IQ because I know it much better – all of this has similar application with Spivi. On a related note, I learned a little known trick that could potentially save a new studio enough money to pay for PIQ or Spivi – contact me if you're interested in learning more. The PTP (Personal Threshold Power) mode screen in PIQ offers a quick (just three minutes) and simple tool to give your riders an approximate understanding of their maximum sustainable power wattage. Then through the wonders of technology, PIQ creates 5 power zones and displays them as different colors. The system calculates PTP as 90% of the highest sustainable power each rider can sustain for the length of the three minute test. Is PTP as accurate as a 20 Threshold assessment? It doesn't matter to ~98.5% of your riders. What is important is that PTP answers the question that I've heard over and over the past 3 years I've been teaching with power: how hard should I be working… when you ask me to work hard? Paul and I are in agreement here – we both feel you should be including PTP in most, if not all classes. There are of course exceptions. You may have a teams challenge scheduled or focus on a class that's directed toward handicapping everyone based on watts/pound. You see we each teach very different classes. Mine are typically focused efforts in the saddle = how I would run my PTP tests. Paul's classes are much more frenetic, with frequent changes = that's how he conducts his PTP segments. Running a PTP test isn't any different from the Best Effort intervals we suggest you use in a power class that doesn't have a Display Training system. Here's one I included in a recent Performance Cycle class. Track #2 – the first PTP track is important. We’ll use this average wattage for each of the four PTP efforts to follow. Everyone seemed to enjoy Billy Idol – Rebel Yell – 1999 – Remaster – maybe suffered a bit as well. At 4:47 there’s plenty of time to explore PTP. We use the Stage button to reset the averages at the beginning of what I describe as; Your Best Sustainable Effort. It’s normal for riders to miss-judge where they should be, so I’ll often have everyone make needed adjustments and hit the Stage button again to reset the averages. My experience is that everyone will benefit from from a few mini (30-60 secs) PTP efforts to figure out where you should be. On any of the magnetic bikes I like to have find a reasonably challenging climb at around 65 RPM and then have riders accelerate to over 80RPM and observe what it feels like (RPE) and the wattage. Two or three of these short intervals should give your peeps a watts window they can shoot for during the actual 3 minute PTP test. I ask everyone to stand and walk, without touching the resistance, for a minute recovery. To start the PTP test, I'll cue up a track like 83RPM Billy Idol – Rebel Yell and cue finding the cadence. Ten seconds to get everyone there and I will click Calc PTP. Encourage everyone to do whatever it takes to complete the assessment and let the technology work it's magic, figuring everyone's training zones.